In the first week of November, RC students of Appenzeller house get to gather together and explore each other’s talents. By November the students all have a rough idea of each others, and this is a great way to leave a new impression on oneself by performance. Talent show is a fully student-based program in which students perform various talents ranging from magic tricks to beat-boxing. Unfortunately, in this year’s talent show the performances were mostly vocals. One group danced to a number of songs, and about 10 other participants all decided to sing. There was also one rap performance, that brightened up the atmosphere effectively. 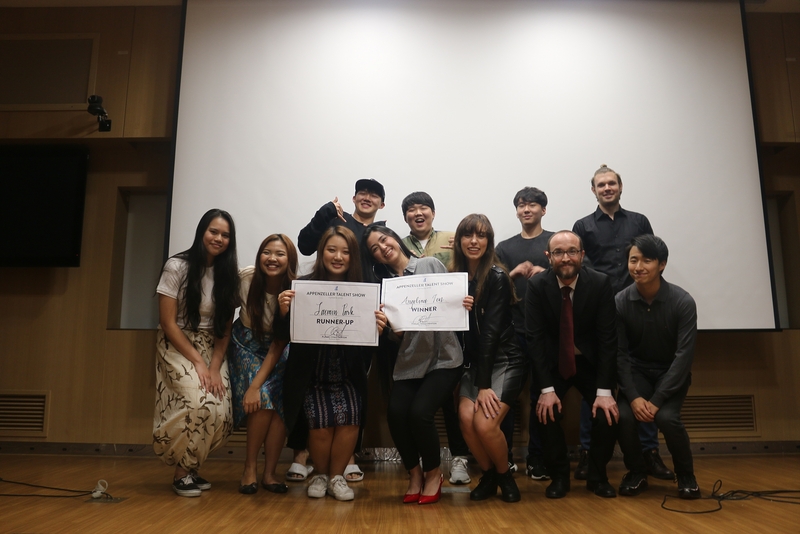 Three RAs also performed – two performances consisted of vocals and one piano, and the RM also played the piano with one of the RCs in a great performance. Overall, there were 13 teams that performed, including the RAs, and 63 audiences who showed up as judges of the performance. Additionally, Appenzeller House invited four faculty members of UIC to assist in judging the performances, along the audience judges who were given forms to submit the scores of the performances. The scores from the judges and the audience were summed up and the final scores were announced on the spot. The Appenzeller Talent Show was a great way to discover each other’s talents and served as a fabulous chance to get to know about members of the house better, leading to stronger bonds within the house.